There is an immense clinical need for novel therapeutics for the treatment of angiogenesis-dependent calcified neoplasms such as osteosarcomas and bone metastases. 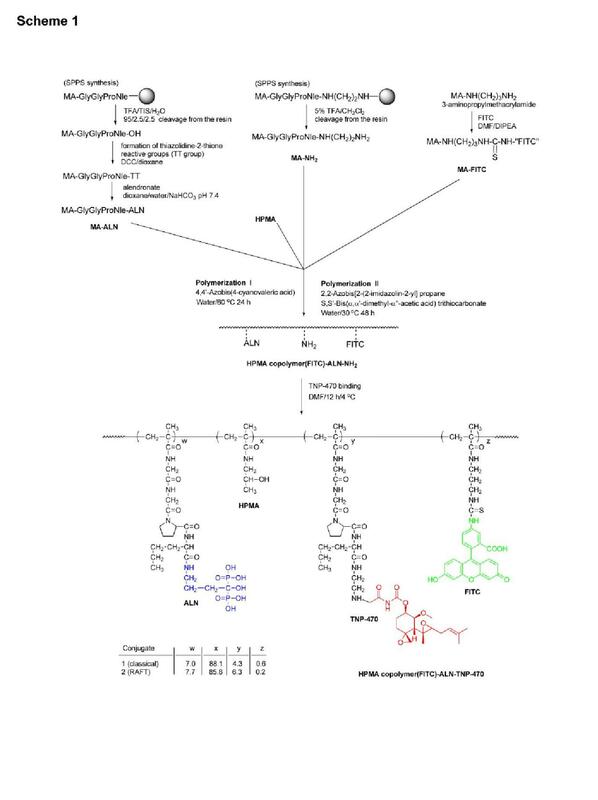 The new therapeutic strategy consists in conjugatin the aminobisphosphonate alendronate (ALN), and the potent anti-angiogenic agent TNP-470 with N-(2-hydroxypropyl)methacrylamide (HPMA) copolymer through a Glycine-Glycine-Proline-Norleucine linker, cleaved by cathepsin K, a cysteine protease overexpressed at resorption sites in bone tissues; this in order to achieve dual targeting. Tumor progression and metastases are highly dependent on oxygen and nutrients supplied by new angiogenic blood vessels which formation is stimulated by the tumor itself and its environment : Anti-angiogenic therapy (combined with conventional treatment) holds great potential for osteosarcoma management and metastatic risk reduction. But synthesizing new targeted angiogenesis inhibitors, optimizing their dose and determining the best combinations of novel angiogenesis inhibitors remain formidable challenges, and there are limits on the use of a single anti-angiogenic agent. Another problem is that the vast majority of clinically used anticancer and anti-angiogenic drugs are small molecules that exhibit a short half-life in the bloodstream and a high overall clearance rate : relatively small amounts of the drug reach the target site, and therapy is associated with low efficacy and severe side effects. From here the strategy of using a copolymer in the therapeutical approach : a first generation of copolymer was designed by Satchi-Fainaro et al., who synthesized and characterized a 30 kDa water-soluble HPMA copolymer–Gly-Phe-Leu-Gly–TNP-470 conjugate, named caplostatin. 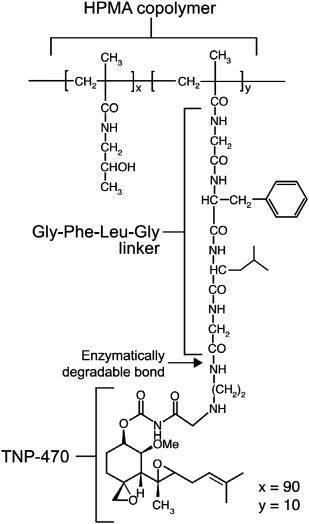 The tetrapeptide linker (Gly-Phe-Leu-Gly) that facilitated the conjugation with HPMA copolymer is stable in the circulation, and cleavable by the lysosomal thiol-dependent proteases, particularly cathepsin B which is overexpressed in many tumor cells and tumor endothelial cells; caplostatin is selectively accumulated in the tumor microvasculature due to the passive targeting phenomenon. This conjugate did not cross the blood–brain barrier and did not induce neurotoxicity as did the unconjugated TNP-470. Caplostatin has a broad antitumor spectrum and can be administered over a dose range more than tenfold that of the original TNP-470 without any toxicity. this conjugate did not cross the blood–brain barrier and did not induce neurotoxicity as did the unconjugated TNP-470. Caplostatin has a broad antitumor spectrum and can be administered over a dose range more than tenfold that of the original TNP-470 without any toxicity. In addition to its anti-angiogenic activity, caplostatin is the most potent known inhibitor of vascular hyperpermeability : this is partly explained by TNP-470's inhibition of VEGF-induced phosphorylation of the receptor for VEGF (VEGFR-2), calcium influx, and RhoA activation in endothelial cells. Caplostatin represents the most broad-spectrum anticancer agent known. 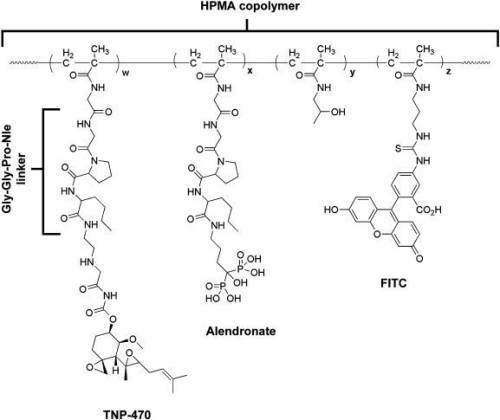 Recently, a second generation of caplostatin was synthesized : a novel conjugate of HPMA copolymer, TNP-470 and the aminobisphosphonate, alendronate (ALN). -> TNP-470 is a low molecular weight synthetic analogue of fumagillin able to selectively inhibit angiogenesis and suppress tumor growth. Because of dose limiting neurotoxicity, TNP-470 has been stalled in Phase II : to apply this drug clinically to more effectively treat tumors, drug targeting to tumor tissue is necessary to increase site specificity and reduce side effects. -> Bisphosphonates (BPs) are analogues of inorganic pyrophosphate, an endogenous regulator of bone mineralization, and they have been shown to inhibit angiogenesis. Their strong affinity to bone mineral, their low toxicity and anti-angiogenic activity make the BPs excellent candidates for targeting calcified neoplasms. ALN is a nitrogen-containing BP drug approved by the FDA that acts as a specific inhibitor of osteoclast-mediated bone resorption and several other bone diseases. In addition, ALN was found to have anti-angiogenic activity through suppression of VEGF-induced Rho activation in an ovarian cancer model, inhibition of a key enzyme, farnesyl pyrophosphate synthase, in the mevalonate pathway, and regulation of cellular level of MMP-2 expression in osteosarcoma cell lines. ALN bears a primary amine which facilitates conjugation with HPMA copolymer, which is bound to TNP-470, through a cathepsin K-cleavable linker, glycine-glycine-proline-norleucine (Gly-Gly-Pro-Nle). Cathepsin K is involved in bone resorption and its expression is stimulated by inflammatory cytokines that are released after tissue injury and in bone neoplasms. HPMA copolymer-Gly-Gly-Pro-Nle-ALN-TNP-470 conjugate was synthesized in two steps. First, an intermediate was synthesized by copolymerization of HPMA, ALN monomer (MA-Gly-Gly-Pro-Nle-ALN), and amino group containing monomer (MA-Gly-Gly-Pro-Nle-NH2NH2). Optionally, for the evaluation of subcellular trafficking, a polymerizable derivative of FITC, N-methacryloylaminopropyl (MA-FITC), was added to the monomer mixture. In the second step, TNP-470 was linked to amino groups by nucleophilic substitution of the terminal chlorine of TNP-470. This study describes a new concept of a combination therapy that aims to target angiogenesis-dependent calcified neoplasms. It was achieved the synthesis of a conjugate with a predetermined molecular weight with a narrow polydispersity and a high loading of ALN using the RAFT polymerization technique. HPMA copolymer-ALN-TNP-470 conjugate potentially delivers the anti-angiogenic agent by dual targeting of angiogenesis-dependent calcified tumors. ALN combined with TNP-470 have synergistic inhibitory effect on the proliferation of endothelial cells. Furthermore, our nano-conjugate is capable to internalize into the cytoplasm of HUVEC and Saos-2 human osteosarcoma cells via endocytosis. The conjugate inhibited HUVEC proliferation, migration and capillary-like tube formation in vitro. In addition, it has been showed that Saos-2 and MG-63-Ras human osteosarcoma cell proliferation was similarly inhibited by the conjugate and by the combined free drugs demonstrating that the bound drugs retained their antitumor activity following polymer conjugation. As a result, the in vivo antitumor efficacy of TNP-470 and ALN have been substantially improved. Combined administration of angiogenesis inhibitors with chemotherapies yield maximal benefits because such combinations destroy two separate compartments of the tumor. Some anti-angiogenic agents can “normalize” the abnormal tumor vasculature, resulting in more efficient delivery of drugs and oxygen to the targeted cancer cells, and enhancement of the efficacy of radiation therapy and chemotherapeutic agents. All of these mechanisms imply that an anti-angiogenic agent would further augment the response to chemotherapy. Despite the relatively good tolerance of angiogenesis inhibitors when administered as single agents, the non-targeted anti-angiogenic drugs often exhibit a non-specific body distribution. This could result in different side effects such as hypertension, proteinuria, bleeding, gastrointestinal perforation, arterial thrombotic events, exfoliative dermatitis and skin toxicity. Therefore, utilization of combination therapy advantages with targeted drug delivery system is desirable and was taken in consideration when the described conjugate was designed. It has been shown that ALN inhibits cell survival stimulated by the PI3K/Akt/NFkB pathway via inhibition of the initial step, the activation of PI3K, thus causing apoptosis of osteosarcoma cells. It also inhibits MMP-2 secretion by osteosarcoma cell lines. The synergistic effect of the combination of ALN and TNP-470 might be the consequence of the different mechanisms of action of the drugs. An effective administration of this new generation drug can be subcutaneous, but there are other possible routes of administration of the conjugate: intravenous and intraperitoneal. Most likely, intravenous administration will be the most effective because the conjugate is directly administered into the blood circulation, making the tumor endothelial cells, i.e. the conjugate's target, directly exposed to it.